This time last year I was struggling to run. Well that’s not strictly true, I wasn’t running. I’d not been signed off by the consultant or my physio after my dislocated and fractured shoulder, but exactly a year ago yesterday I did walk Whernside in a sling. I was able to start running again, slowly in a sling around the end of April 2018 and was knocking out 24.45 minutes at parkrun. However, I decided against attempting to run Liverpool Marathon as planned, or even dropping to the half as it would have been too risky. My appreciation for running has evolved hugely since I wasn’t able to run for quite some time and I now genuinely appreciate every run in case it does for whatever reason end up being my last. My last marathon at Yorkshire in October 2017 was my second fastest out of 9, but didn’t go to plan with a knee niggle at 9 miles in and with Manchester marketed as “flat” I had hoped I’d be able to get closer to my PB of 3.47… or even close to good for age! Although I know I’m a good 5 kg heavier than when I ran my PB, which doesn’t really help matters! Training has been pretty good this year, I’ve been getting out at least 4 times a week and have only really missed out one long run. I even managed to complete Spen 20 in the worst conditions I’ve probably ever run in and got around in 3 hours 12, so logically I figured a flat full marathon I should be coming in sub 4 hours. I got up early and made my long run breakfast which is usually perfect fueling – porridge oats, milk, golden syrup and peanut butter and took it with me to eat in the car. I made sure the night before to drink plenty of water, but not too much on the morning. I slapped 3 layers of compeed on an annoying blister on my ankle to try and avoid it being a niggle during the race. We were taking Danielle – Alan’s colleague with us to Manchester and we set off at 6.30am and then aimed for Ladywell park and ride tram stop which was a perfect transport plan as we got off at Pomona and it was about a 10 minute walk to the start area with plentiful toilets and slightly chaotic and unpoliced, but easy to access start pens. We had a good hour to spare which was perfect. I always get toilet anxiety before races and usually have to go at least twice, As the first few waves set off and Danielle was in a wave in front of me I took the chance to jump out of the pen area and have a last minute pee break. I set off aiming for a comfortable pace (I know I have a habit of setting off too fast) and happened to more or less fall in line with the 3.45 hour pacer who initially seemed a bit too fast, then a bit too slow when I overtook him about 6 miles in. I was hitting an average of 8.30 minute miles for the first 10 miles and dropped slightly the pace slightly but hit splits of 52 mins 10K, 1.55 for the first half and then 2.56 for the 30K mark. I tried to be careful with nutrition and just drank my own electrolytes and water for the first 6 miles and took on a few shot bloks every 40 minutes. It’s always too tempting for me to take on too much water, but I tried to make sure I drank a few sips and then used the rest to cool down my hands as they always swell massively when I run long distances. It was lovely to bump into Lois just after the halfway point who was going for (and achieved!) sub 4 hours. She was looking on great form and really comfortable. For the first half my Garmin was telling me that my estimated finish time was anything between 3.40 and 3.55. The 20 – 30K distance was hard as I started to feel like I had some stomach cramps and had to slow down a bit, I got to the “hill” at mile 12 which wasn’t too bad at all and by this point my I still felt like I had energy, my legs were ok and I had not had any blister issues. A bloke tried to chat to me asking me if I ran Woodhouse Moor parkrun and told me that he’d seen my photos on Facebook, it was a bit odd and I was still trying to focus on my own running and he was slower than me so I powered on probably seeming rude. I started feeling really quite queasy around mile 15 and so stopped for a toilet break, which turned out to be unnecessary after I’d queued up. I managed to more or less run for another 3 miles, but then I started to feel really cramped up and painful and so run walked until I could see the toilets again and had to spend a good few minutes in there. I was really feeling poorly at this point and quite light headed. I looked at my phone for a bit and ended up reading a message from that morning from an old school friend Jenny who I’ve not seen for around 20 years telling me that my posts about parkrun had inspired her to give it a try – it helped to spur me on when I knew I had 8 and a bit more miles to complete. I tried to run, but it just wasn’t happening, it was so frustrating as I had energy, I had no injuries, but I just couldn’t move my body. I knew that I could walk fast and that I felt well enough to complete the race because I’m stubborn and I don’t have any races as DNFs and so this wasn’t going to be my first. I tried some of the carbo gels on offer to see if that would fix me, they didn’t. I kept on walking and walking and fortunately Manchester is an interesting route and so there was plenty to occupy my mind although walking past people cheering you on is an odd experience – I wanted to say “I’m ok I just can’t run!”, but it was a bit too complicated so I just smiled as much as I could and kept walking. A man ran past me and said “Do you know Nicola Forwood? Tell her not to stand up Mark again!” I’m assuming he was guessing from my HPH vest I would know her, although I don’t know who he was – all I saw was the word “Arena” on the back of his t-shirt! 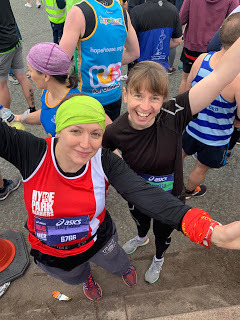 At around mile 20 something else happened to my body that I’ve only had once before during my fastest running of the Yorkshire 3 Peaks (5 hours 44) and it felt like I had a particularly bad case of Cystitis. Every time I tried to run was incredibly painful, so I just carried on walking. I stopped again for an even longer toilet break with less than 5K to go and messaged Alan to apologise for the fact they’d be waiting for ages for me. I kept on walking and approached a group of people playing music and heard the chorus of “One Day Like This” by Elbow and as I was walking I could hear it for much longer than if I’d been running past. It feels like an emotional song for me anyway as it reminds me of seeing them with Alan and with all the emotion you get from running a marathon it made me burst into tears and I spent the next mile sobbing and smiling at the same time as I carried on walking. I tried to jog whenever I heard music, but my body just wasn’t letting me. 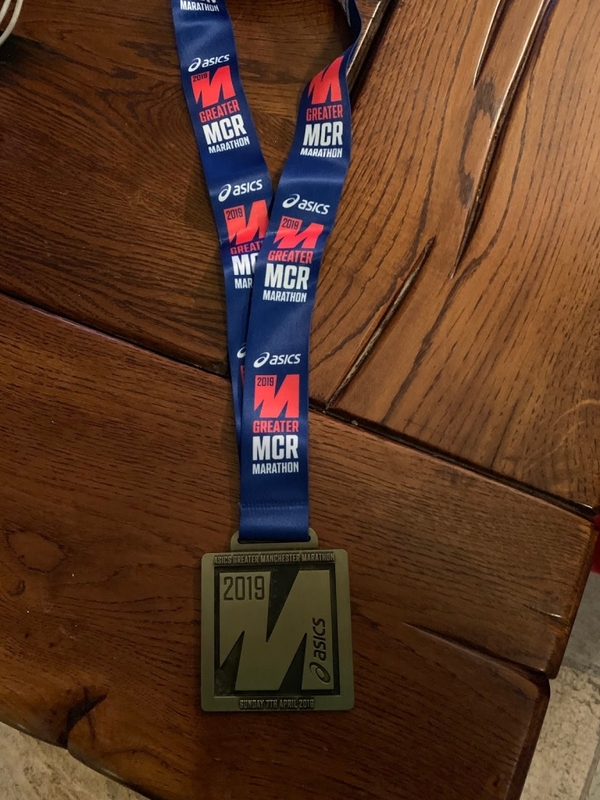 A lady shouted to me at mile 25 “keep going half of Manchester is just there to cheer you on” and she wasn’t wrong the support as you get into the final mile is fantastic, which made it all the more embarrassing that I was still walking. I managed to run for the last couple of 100 metres and spotted Alan who was cheering me on and got over the finish line looking like I might have at least run a bit of it. I think my running photos will look ridiculous though as I’m definitely crying in at least one of them! The finish area was a bit confusing (although it’s probably just because I was exhausted!) and so I got my medal, soreen, t-shirt and water and went to the toilet (again!) before managing to find Alan and poor Danielle who had finished over an hour before me with an amazing 3 hour 40 time knocking over 30 minutes off her PB. My gun time was 4:54.30 – it took me nearly 2 whole hours to do the last 12K! Some people might say why did I bother finishing, why not take the refuge bus if I was feeling ill, but I know myself well enough on long distance running that I wasn’t going to pass out and if I did feel that bad I’d sit down and get some help. If I’d have known I was likely to feel that poorly when I was running I may not have got to the start line, but I felt absolutely fine when I set off. Maybe I was ill and didn’t realise with a bug or something, maybe I ate something dodgy the day before (the pasta dish from Friday night left out on the cooker all day probably wasn’t the best pre-race meal!) maybe it was just not my day – which was a shame as the potential to have a good race was all there on paper. Ultimately I’m stubborn, I wanted a medal and I wanted to retain my clean record of always completing a race that I’ve started and I knew I wouldn’t damage myself by doing so. I know some people criticised Paula Radcliffe when she pulled out of the Athens marathon at mile 22 in 2004 and I’ll be honest before I had run a marathon I couldn’t understand why she wouldn’t limp around for her country and complete the race for her country. However, as running was her job, she would potentially have destroyed her chances of future success, so I completely get it and I would advise anyone in that situation to pull out and seek help. If you are only pushing yourself for the sake of it and are actively damaging yourself further, it’s not worth it – there are always more races! You’ve got to do what is right for your body at that moment in time. I staggered around and found Alan and Danielle and we managed to get back to the tram station and back to the car and the cystitis feeling was still there and extremely painful. In the car on the way back Danielle fed us with some home cooked sausage rolls, cheese straws and rocky roads which were all very welcome and very delicious! NB. The cystitis thing was awful all evening, but has gone this morning – I did what you are not supposed to do and googled it and found this article which perhaps explains it and also means I perhaps should try and have less anxiety wees! It”s either a rare running anomaly or one of those things we don’t discuss as runners, but perhaps should mention so we don’t all feel like weirdos?! So I’m left feeling disappointed with myself, a little at least, but this is exactly the same time I ran my first marathon at Edinburgh in 2010 to the minute. Running a marathon teaches you loads about who you are as a person, what you can overcome and having felt less than strong in some areas of my life recently it’s been a really positive boost to have at least managed to get myself over the finish line. I definitely maintain running a marathon in 4 hours is much less painful than running it in nearly 5 hours or longer, so I am in massive admiration of runners smashing sub 3 hour times or those completing it in 6 hours, 7 hours or more – they’re all huge achievements. My last comment is that this is one bad marathon out of 10 that I’ve run, so don’t let it put you off having a try – the most important thing you can do is train well and plan effectively for your day and listen to your body carefully if it doesn’t go to plan for you on the day. 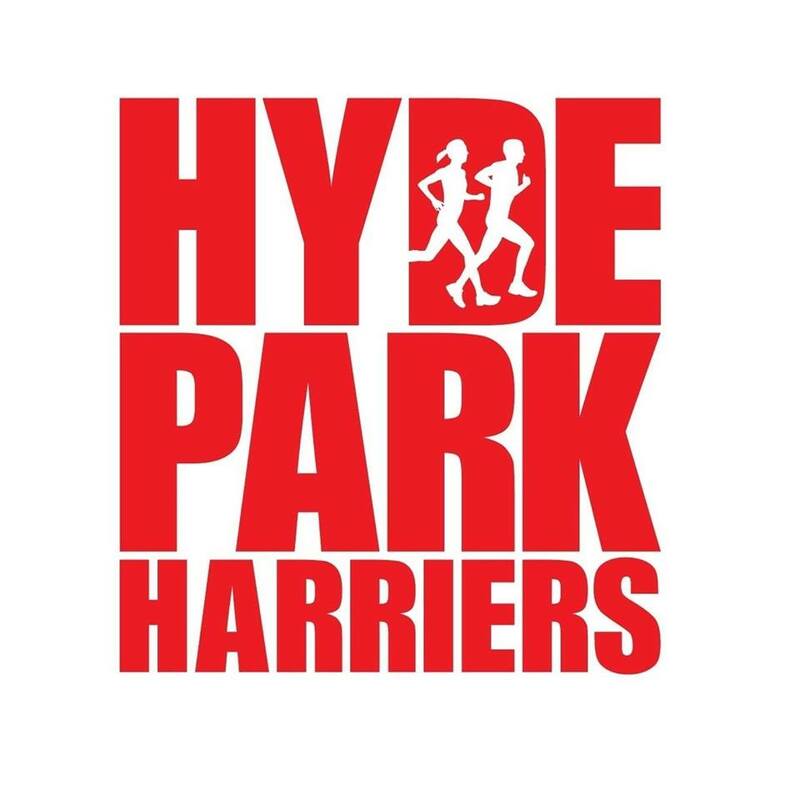 And so I now look to putting to bed the ghost of 2018 and this race and running Liverpool in 7 weeks the marathon that I had to miss last year because of my shoulder – wish me luck!